Greetings again from the darkness. Most youngsters have executed a perfect eye roll on at least one occasion after receiving a dose of parental advice that seemed irrelevant to them at the time. An early scene in this biopic finds teenage Olga listening as her mother says, “To commit suicide you need a strong will, my child. Something you certainly don’t have. Accept it.” This is a warning shot fired at the audience to be cautious when judging the actions of the last woman executed in Czechoslovakia. 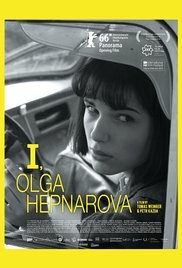 Co-directors Petr Kazda and Tomas Weinred seem to believe that most viewers will be familiar with Olga’s story, and presume the film’s austere look, lack of flow, and structure of seemingly unrelated scenes will provide a sense of the choppiness and isolation that might explain her otherwise inexplicable actions. Based on Olga’s true story and the book from Roman Cilek, the film will have you questioning whether her behavior was the result of horrible parenting, or more closely related to her psychological issues – perhaps even schizophrenia. Michalina Olszamska (The Lure) delivers a committed performance as Olga, the 22 year old woman who in 1972 drove a truck into a group of people in Prague, killing 8 (all between the ages of 60 and 79). A year later she was hanged, becoming the last woman executed in Czechoslovachia. The movie focuses on the various elements and key moments of her life – father’s abuse, mother’s iciness, attempted suicide, treatment in asylum, rejection by a lover – that led to her isolation and feelings of alienation. We sense her internal rage building over time, and her inability to cope or even connect with others; though at times we question whether her troubles are by choice or a result of her treatment … it’s kind of a twist on the nature vs. nurture debate. There have been other fine movies that have dealt with a similar theme: There’s Something About Kevin, The Omen, The Bad Seed. Each of these deal with the whole good vs evil idea … are some kids born “bad” or are they pushed that way? Either way, it’s a parent’s worst nightmare. This black and white presentation allows us to keep our emotional distance from Olga, and the no frills approach provides a quite chilling reenactment of how Olga ended up sending a letter to the local newspaper announcing her intention to seek “revenge” for the hatred that society had heaped upon her for years. This entry was posted on Thursday, March 23rd, 2017 at 7:48 pm and is filed under Drama, World Cinema/Foreign. You can follow any responses to this entry through the RSS 2.0 feed. You can leave a response, or trackback from your own site. I suspect the storyline and the description of how things flow, or not exactly do, might not appeal to some, but you know me David, it’s just one I have to see. My curiosity will not be satisfied if I don’t. I was not familiar with the history nor the book about it, so I’m glad there’s a movie then, and that you chose to watch it so you could tell us about it.